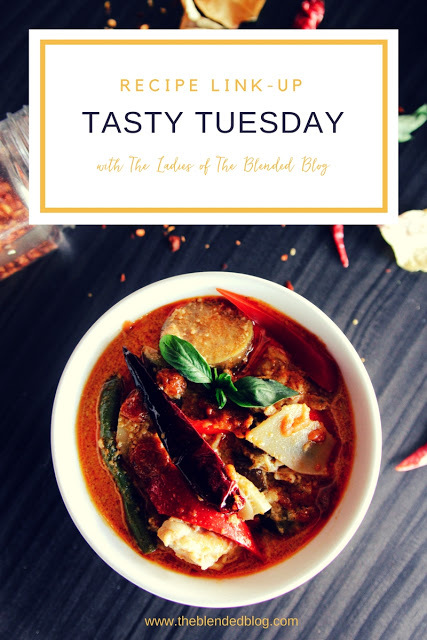 Hello TBB readers! 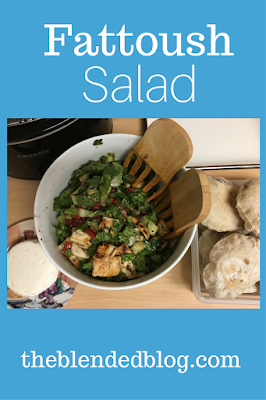 Sheila from Making the Most of Every Day here to share a yummy salad recipe with you today! Our host last weekend picked Syrian food. I have made falafel, tabbouli, and hummus before so I knew I couldn't sign up for that. I decided on fattoush and homemade pita. I've never made either before. Wash all ingredients (except for pita, of course!) and chop or slice, adding to a large salad bowl. Separate the pita leaves and dry them out in an oven for a few minutes (or this is a great way to use up stale pita!). Heat 3 tablespoons of olive oil in a heavy skillet. In the meantime, cut the pita into 2 inch squares. When the oil is hot, add pita to pan, sprinkle with salt and 1 tablespoon of sumac spice and saute'. You want the pita to get toasty and crisp! Pull off the heat and cool. While the pita is cooling, make the dressing. Add pita croutons and toss again. You guys. This salad is SOOOO yummy! The sumac is essential! It really makes the recipe sing and there's really no substitute. I looked at Publix and couldn't find it. I've heard you can find it at Penzy's but if you have a middle eastern market near you, check there. Did you see how much I ended up buying? I'm sharing with some friends because it's a LOT! I asked the store owner what else I can put it in. She said to add it to soup and you can use it to make mussakhan and then proceeded to tell me how to make it. It sounds delicious and I'm going to totally give it a try! The store I bought the sumac from also had Syrian cheese and freshly baked pita and even though I was making pita I bought a bag because what if my pita didn't turn out? (That pita was so good! I ate one in the car ride on the way home!) I wasn't wild about the cheese. In the picture above you can see my funny shaped pitas. To see how I made the pita bread, you can visit my blog here. I love salads and this was a different one than my usual. I shared my "salad formula" here if you want to see how I usually build a salad. Now link up your recipes for us to drool over! Thanks for visiting!